One aspect of science that I try and emphasize time and again is that it is a community effort. Individuals can make discoveries, but individuals are subject to mistakes (such as the recent arsenic life brouhaha), deliberate fraud (as in the fictitious MMR-autism link fabricated by Andrew Wakefield) or can simply go crazy! Individual scientists, or even small groups of them, can give life to incredibly damaging nonsense; fortunately, there are usually other enlightened researchers out there that will boldly do battle with this misinformation. One bit of pseudoscientific nonsense that still, sadly, remains with us today is what is known as pyramidology. Broadly speaking, it is the belief that pyramids in general, and the Great Pyramid of Giza in particular, holds hidden secrets — lost knowledge, secret builders, even supernatural powers. This “science” of pyramidology is surprisingly old: its biggest proponent was Charles Piazzi Smyth (1819-1900), an important astronomer who began his own pyramid researches in the 1860s and wrote a number of “scholarly” books on the subject that arguably sparked the persistent pyramid craze. Fortunately, pyramidology did not survive long in the scientific community, thanks to a number of pointed critiques by Smyth’s scientific colleagues. Of all the abuse that Smyth received at the hands of other scientists, however, none was more hilariously devastating than that delivered by Athanasius Diedrich Wackerbarth. In 1867 he wrote a critique of Smyth’s work that was read before the Royal Society of Edinburgh and left the distinguished astronomer fuming!Smyth’s deluded view of Egyptology, and Wackerbarth’s rebuttal of it, are great illustrations of common scientific fallacies. We can learn a lot about the way science is done by taking a look at Smyth’s scientific and mathematical mistakes. Charles Piazzi Smyth (1819-1900), via Wikipedia. If Charles Piazzi Smyth had never undertaken a study of the Great Pyramid of Giza, he would be remembered best today as having been a masterful astronomer. Born in Naples, Italy, his middle name Piazzi came from his godfather, Giuseppe Piazzi, an Italian astronomer who discovered Ceres, the largest member of the solar system’s asteroid belt. Smyth’s father built an observatory at their home in England, giving the young Charles Piazzi an early opportunity to follow in his godfather’s footsteps. At age 16 Smyth became an assistant to an astronomer at the Cape of Good Hope in South Africa, and while there made observations of Halley’s comet as well as of the Great Comet of 1843. Smyth made a painting of this latter comet that is now in the National Maritime Museum in England. 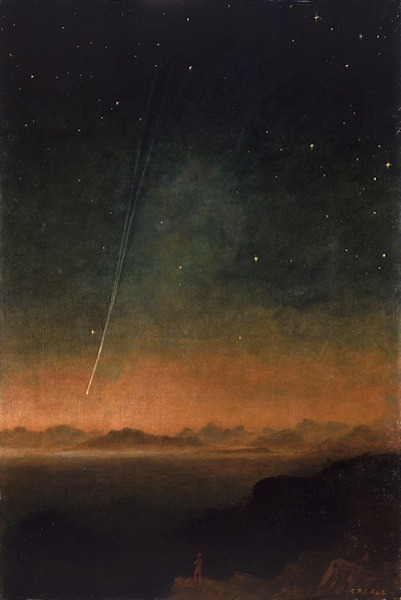 Charles Piazzi Smyth’s painting of the Great Comet of 1843 (source). 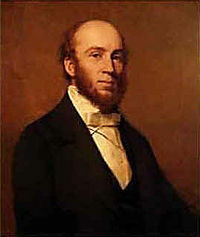 In 1846, Smyth became the Astronomer Royal for Scotland, and professor of astronomy for the University of Edinburgh. Among his many achievements was the establishment of an observatory on a mountaintop on the Canary Islands in 1856. Some 150 years earlier, Isaac Newton had proposed that atmospheric effects in astronomy could be mitigated by high altitudes; Smyth’s observations on Tenerife were apparently the first deliberate confirmation of this hypothesis. Sometime in the early 1860s, Smyth came into fateful contact with the work of publisher and writer John Taylor (1781-1864), who in 1859 had published a book titled, The great pyramid; why was it built: & who built it? This work postulated that the Great Pyramid had secret knowledge encoded in its dimensions, starting from the observation that the ratio of the pyramid’s perimeter (3024 ft) to its height (481 ft) is roughly equal to 2π (6.283 for π, 6.286 for the ratio). Taylor decided that this was intentional, implying the Egyptians had determined an accurate value for π centuries earlier than Europe, and he saw other secrets built into the dimensions, position, and even weight of the pyramid. Smyth was enthralled by Taylor’s speculations and, in 1864, traveled to Egypt himself to painstakingly measure ever aspect of the Great Pyramid, inside and out. That same year he published his own book on the measurements and secret meaning of the structure, titled Our Inheritance in the Great Pyramid*. Being a member of the Royal Society of Edinburgh, Smyth was able to present his ideas to the greater scientific community for scrutiny as well. Are there, however, any other reasons than such mere convenience, why we should attach any significance, touching importance int he design of the Great Pyramid, to these particular numbers? In the first place, 366, which represents here (for our arbitrary diameter of a circle 116.5) the π circumferential analogy of that circle, is also the nearest even number of days in a year; or more precisely, of solar days in a mean tropical solar year; or, again, of day-steps in the circle of a year, the most notable and important of all circles to man. We now know, by modern science, that the exact number of these day-steps in the natural year is 365.2422 + an almost endless fraction of unascertained length; though practically, and for the ordinary purposes of life, all civilised nations now use 365 even; except in leap-year, when they do, evenly also, make their year to consist of 366 days. In the second place it may be stated, that that portion of the Pyramid employed as the chief datum of linear measure in the problem under discussion, viz., the length of each side of its square base as determined by the “socket” measurements, both of the French savants and Colonel Howard-Vyse, when it comes to be divided into 366 parts, seems to give each of them a length approaching nearly to one ten-millionth of the earth’s semi-axis of rotation, or close upon 25 British inches. Equivalent, therefore, if further and independently proved, to the architect having laid out the size of the Great Pyramid’s base with a measuring-rod 25 inches long in his hand; and in his head, the number of days and parts of a day in a year; coupled with the intention to represent that number of days in terms of that rod on each base side of the building. Now, the Pyramid earth density comes out most simply, on the showing of the parts of the Pyramid itself, from the cubic contents of the coffer in Pyramid inches, divided by the 10th part of 50 inches cubed. Whence, trusting to my measures, it is: — 71,250 divided by 12,500; the quotient being 5.70; a result which modern science may confirm, but cannot overthrow at present, if she ever will. This latter argument hopefully begins to make clear the problem with Smyth’s entire argument and his calculations. Given a large set of numbers, if one divides and multiplies them together in various combinations one will inevitably get a result that superficially matches some quantity of significance. The same problem underlies all of numerology and related fields such as finding “Bible codes“. 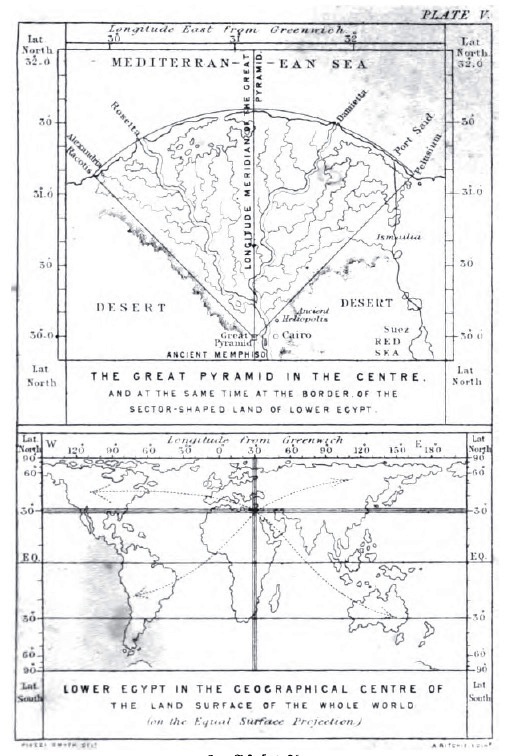 Smyth goes even further in his belief in pyramid secrets; as the following figure from his book demonstrates, he believed that the Great Pyramid was deliberately placed at Giza as the “geographic center of the land surface of the world”. Why, it seems almost to imply,– so far as the closeness of a 25 British inch length, to being the key for opening this part of the design of the Great Pyramid, is concerned, — that there was more of intercommunication in idea and knowledge between the architect of the Great Pyramid, and the origines of the Anglo-Saxon race (whose national unit of linear measure the inch more especially is) than between the said architect or designer of the one Great Pyramid in Egypt, and all the native Egyptian people of all the ancient ages, with their invariable 20.7 inch cubit, which explains nothing, except their early connection with Babylon; and they, the holders of it, idolaters worse than those of Babel, and Cainite religions professors every one of them. Even further, Smyth concludes (as Taylor did) that the actual builders of the pyramids were the “chosen people” of the Bible, and that the simple relation between the 25-inch metron and the British inch implies that the British system of units in fact derives from the children of Israel! 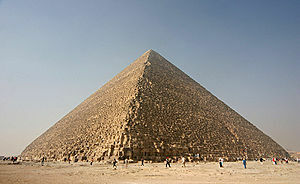 Obviously, Smyth was injecting his own religious and political beliefs into his views of the Great Pyramid. Smyth published his results in the Transactions of the Royal Society of Edinburgh, volume 23, “On the reputed metrological system of the Great Pyramid” (1864), p. 667-706. Here it came to the attention of another learned scholar, Athanasius Diedrich Wackerbarth (1813-1884). Francis Diedrich Wackerbarth was born in London, and from an early age was groomed to take on a career in the Church of England. After an early education in the classics and mathematics, he received his B.A. at Cambridge in 1835, and became the curate of Peldon in Essex in 1837. His religious views changed dramatically in 1841, and he converted to Roman Catholicism, taking the new name Athanasius at baptism. His early career found him incredibly productive in studies of the classics, including a well-regarded 1849 translation of the classic epic “Beowulf”. In 1851 Wackerbarth took a trip to Copenhagen to study languages and, while there, visited Uppsala. He so enjoyed the latter city that he decided to stay, and would in fact live there the rest of his life. Having a passion for astronomy, he quickly became connected to the observatory in Uppsala, and in 1860 he became the Amanuensis of the observatory. During his tenure there, he published a number of astronomical observations. Mr. Wackerbarth was, as one can readily see from the above sketch, a man gifted with an astonishing memory, an uncommon power for work, and an especial ability to grasp at once the most important parts of a subject. And without doubt it was a loss to science that the earlier stage of his life was devoted to other pursuits. In his views, as in his studies, he endeavoured always to place himself as far as possible on the foundation of objective truth, and never spared any labour to attain this object. For scientific metaphysics he entertained disgust, bat still more for the want of clearness and consistency, and often even want of truth by which human work during the development of the great questions of the day is usually impaired. The author gives a detailed statement of the theories of Professor Smyth, as given in the Transactions of this Society, Vol. XXIII, Part III. He then, after heartily commending the zeal and diligence of the Professor, brings forward objections to some of his views. 1. 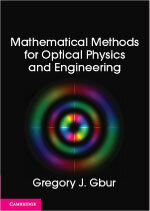 As to the metron or unit of linear measure. Mr. Wacckerbarth objects that this measure was utterly unknown to the ancient Egyptians — appearing in no Egyptian document or monument whatever, nor in any ancient writer who describes the condition of the Egyptians. In short, Wackerbarth makes the objection that we noted earlier — the Egyptians didn’t use any unit of measure even remotely close to the “metron”. Wackerbarth helpfully provides a table of all weights and measures used by the ancient Egyptians, and which clearly does not include the metron. “It is really very unpleasant to reject a beautiful and ingeniously carried out theory which one wishes to believe, but I cannot, however, arrive at any other conclusion than that Professor Smyth’s very interesting account of an ancient Egyptian standard of length, exactly equal to a ten-millionth of the earth’s axis of rotation, and the entire system of weights and measures that he has deduced from this imaginary unit, requiring accurate knowledge of the earth’s dimensions, figure, and density, several centuries before the age of Abraham, and the supposed connection of the English measures with these, are things purely mythical. On the other hand, that the pyramid and its contents were really the standards of the ancient Egyptian kingdom, is, or seems to me an opinion not destitute of probability; but I cannot think that those standards were constructed with any reference to the dimensions of the earth, but that they were arbitrarily chosen quantities, intended to represent on a tolerably large scale the size of those portions of the human body which their names indicate: e.g. cubitus, the arm from the elbow to the point of the middle finger; palmus, the breadth of the hand, &c., &c.
Without saying as much, Wackerbarth is powerfully citing Occam’s razor: “the simplest explanation is usually correct”. It is much more plausible that the pyramid was constructed with the existing length standards of the time than some secret, otherwise unrecorded standards of length. “In fine, Professor Smyth’s method, namely, that of multiplying or dividing by quantities, for the introduction of which it would be hard to give any satisfactory reason, — as, for example, the number 366, with which the base was divided, and which is neither the exact number of days in a sidereal year, nor anything else, and again, the very uncertain number, 5,672 (the earth’s density), — appears to me in the highest degree dangerous. How deceitful results thus obtained can be, I shall now, in conclusion of this discussion, attempt to illustrate by a few examples; and before doing this, I beg to state that, entertaining the highest respect for Professor Smyth, I have not the least intention of making light of his work, though this method of reasoning, being analogous to the reductio ad absurdum, will unavoidably at times have something of that appearance. “Ex. 1. It is a historical fact, that the present English weights and measures are not of any very great antiquity. At the time of the Norman conquest the yard was about 39.6 of the present English inches, a little longer than the French metre; and the foot, accordingly, 13.2 modern inches, a little greater than the Paris foot. In the year 1101, King Henry I determined the yard by the length of his own arm, and that is the determination which the present yard is intended to represent; and that yard, moreover, has never been, even in modern times, definted by any fraction of any of the earth’s dimensions, but by its proportion to the length of the seconds’ pendulum at 51 ½° latitude, and of this yard the English foot is the third part. Now, a degree of the equator is just 365,260.524 ft. Divide a thousandth part of that number by the length of the sidereal year in solar days, 365.256358, and we have 1.0000114; that is to say, if we take a thousandth of a degree of the equator, and divide it by the number of days in a sidereal year, we have an English foot as nearly as a powerful microscope can determine it. And yet it is certain that this is purely accidental. Ouch! And this is just the first example. “Ex. 2. If I take 10,000 times e, the base of the hyperbolic logarithms, and multiply it into the quantity, which in the lunar theory is called g, — that is, the ratio of the difference between the moon’s and its ascending node’s mean motions to the moon’s mean motion, — and divide the earth’s polar radius by the product, the result is the length of the pyramid’s side. But are we to suppose that the Egyptians forty centuries ago were acquainted with the lunar theory, the earth’s compression, and the use of logarithms, and, moreover, took this clumsy method of perpetuating their knowledge? Is it not far more probable that the architect simply determined that the length of the side should be 444 cubits, and accordingly measured out that distance? Boom! Boom! Wackerbarth hits Smyth again, a bit more pointed this time. “Ex. 3. Again, if instead of taking Colonel Vyse’s measure of the base, we accept for that quantity the mean of half a dozen of the most trustworthy travellers’ statements,– for instance, Vyse’s, the Franch Academicians’, Caviglia’s, Wilkinson’s, Lane’s, and Davison’s,– we have for the length of the side in English feet a number which expresses in millimetres the mean height of the barometer at Upsala. But will any one maintain that the dimensions of the pyramid were intended by its builders to have any reference whatever to that interesting constant? “Ex. 4. If we multiply together one-tenth of the side of the pyramid’s base, the length of the line joining the middle of the side and the apex (that is, the height of each one of the four isosceles triangles that compose the pyramid), and the modulus for the common logarithms, the result is 3420, the constant of lunar parallax, for which, in Burg’s tables, the value 3420”.96 is given. So, by juggling numbers, Wackerbarth was able to “derive” all sorts of physical quantities, including dimensions of the pyramid itself! But Wackerbarth saved his most stinging rebuke of Smyth for last, and it calls into question Wackerbarth’s claim that “I have not the least intention of making light of his work”! On the 10th of March last I had the honour of receiving, in the usual course of publication, a copy of the 75th Number of our Society’s Proceedings. Both these essays, though by able and ingenious men, are yet unfortunately based to such an extent on needlessly imperfect data, that the superintending Secretary might have justifiably returned the MSS. to their respective eminent authors, with suggestions for improvement in the improvable particulars, before publishing them under the auspices, and at the expense of the Society. Smyth summarizes the arguments of Wackerbarth and another critic, J.Y. Simpson, and then goes on for nearly another sixty pages describing even more numerological arguments! In hindsight, Wackerbarth was absolutely correct, as we have noted, but it would take another prominent scientist to really chase pyramidology from respectable circles. The father of Egyptologist Flinders Petrie (1853-1942) was a close friend of Piazzi Smyth, and Petrie himself became enthralled by the ideas contained in Smyth’s 1864 book. In 1880, Petrie went to Egypt to perform new measurements of the size of the Great Pyramid, and found that the pyramid was several feet smaller than Smyth and Taylor had thought! This, in essence, caused the whole house (pyramid?) of cards that Smyth had built to come tumbling down; Petrie later referred to his measurements as the “ugly little fact which killed the beautiful theory”. It’s fair to say that Piazzi Smyth is not thought of too kindly by scientists today, though I understand he still has a following amongst those who engage in pseudoscientific speculation. It is at least somewhat reassuring to see that it was another astronomer (Wackerbarth) who first called astronomer Smyth on his mistakes. This story should serve as a cautionary tale to those who become too fascinated with elaborate theories supported by the flimsiest of evidence. The story also shows that scientists of the 1800s could deliver a really hilariously painful takedown of nonsense! Postscript: Isn’t the title of this post awesome? One of my proudest achievements. * In researching this post, I read a significant portion of Smyth’s Inheritance. My thoughts on it are perfectly represented by this video clip. Indeed — hopefully that’s part of the cautionary tale of this post — Smyth was, excepting his numerology, a very good scientist! 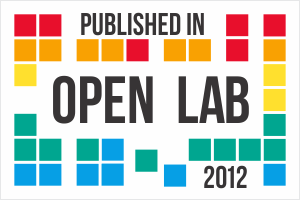 BTW, did you make your blog’s banner according to 3 times the Golden ratio? Yes, it’s all very silly. But, you know, one of my favorite albums is Pyramid by Alan Parsons. So something good came out of the late 20th century resurrection of the fad. So something good came out of the late 20th century resurrection of the fad. Finally finished your essay. Love it! Dudes in the olden days had some words for each other. *sigh* I’d love to see more like this nowadays. Thanks! I find it awesome that the “old-timers” could make a point with devastating snark.